Below is a guest post by Fred Wilson, a VC and principal of Union Square Ventures. 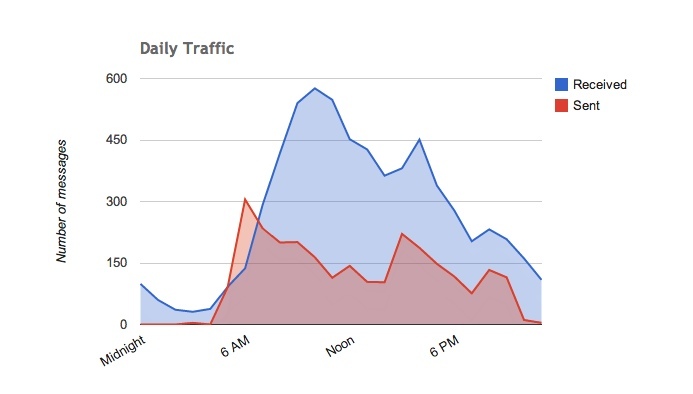 His story of email consumption is part of our “Power User” series for fans of Gmail Meter. I tried out a new service this past week called Gmail Meter. It’s a free analytics service that tells you stuff about how you use Gmail. It is brought to market by the folks at ShuttleCloud, which does archive and data migration for cloud services. It’s a way for them to get to know folks who might become ShuttleCloud customers in the future. The single highest send/reply ratio in my world is the Gotham Gal who sent me 133 emails of which I replied to 100, for a 75% return rate. I’ve got work to to do there. Sorry Jo. My partners Albert, Andy, Brad, and John get between a 50% and 70% reply rate. Sorry USV folks. The one cohort that I send more mail to than I get replies from is my three kids. I get a worse response rate from them than all of you get from me. Not sure how I feel about that. I’ve asked the Gmail Meter folks to add a chart showing reply ratio on emails less than 30 words versus emails greater than 100 words. When I get that chart I will publish it here because I think that is single best secret to getting a reply from me. Anyway, I found this data valuable. Maybe you will too. You can try it out at Gmail Meter. This post was first seen here. Fascinating to see the way that power-users handle email. 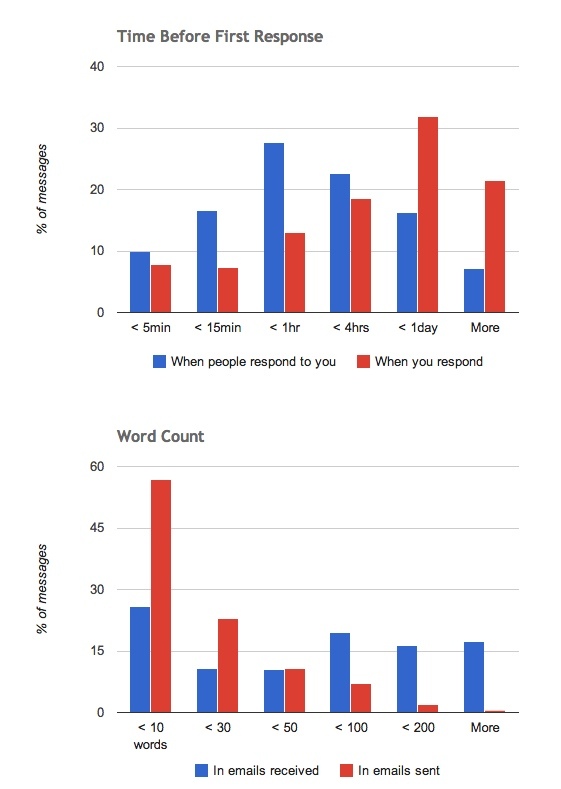 Nearly 60% of emails with less than 10 words. Tip of the hat! I’d like to see that chart too: whether a shorter email to Fred increases the likelihood of a response. What advice would you give to the 516 people who did not get the pleasure of a response – should they try again? What should they change to bubble up to the other side? Fred can it be possible to create stat under labels on gmail? Pingback: WriteThat.Name's blog | 10 email productivity sins and how to avoid them!